Dow Jones futures today are up 33 points after a monthly update on Japan's industrial production offered greater clarity into the impact of China's slowdown on one of the world's largest economies. The U.S. housing market is in focus with the July release of the Case-Shiller Home Price Index, set for 9 a.m.
On Monday, the Dow Jones fell 312 points as concerns about China's economic growth weighed on investor sentiment. Healthcare stocks slumped another 4% as a sell-off in biotech stocks continued. Today is a busy day of economic data releases and speculation about interest rates around the globe. Germany will announce its September Consumer Price Index for the first time since the Volkswagen AG (OTCMKTS ADR: VLKAY) scandal hit the markets. Meanwhile, a report on Japanese industrial production will provide insight into the impact of slowing economic growth in China on the nation's third-largest economy. In the United States, the focus will center on the September report on Consumer Confidence. Markets and political analysts will digest any information released from last night's pivotal meeting between U.S. President Barack Obama and Russian Prime Minister Vladimir Putin. The two world leaders are meeting after they both spoke before the 70th General Session of the United Nations. President Obama and Putin are both in sharp disagreement about how to handle the Syrian crisis and the leadership of Bashar al-Assad. Meanwhile, politics will be in play as the front-runners for the Republican and Democratic nominations continue to spread their message. On Monday, GOP front-runner Donald Trump unveiled his proposed tax plan, while Democratic front-runner Hillary Clinton's focus on price controls in the biotech sector continued to fuel a sell-off in the markets. Oil Outlook: Oil prices continued to slide on Monday over global growth concerns and a glut of supply in emerging markets. WTI prices continue to decline despite news that the United States has seen a decline in oil rigs and four-straight weeks of crude inventories. Shares of Royal Dutch Shell Plc. (NYSE ADR: RDS.A) will remain in focus today. The company's stock fell 3% yesterday after it announced plans to halt energy production in the Arctic Circle despite years of exploration and billions of dollar spent on the project. DMND: Packaged food giant Diamond Foods Inc. (Nasdaq: DMND) will report fiscal fourth-quarter earnings of after the market closes. Estimize analysts anticipate the company will report an EPS of $0.23 on top of revenue of $205.51 million. Meanwhile, Wall Street analysts expect earnings of $0.22 per share on top of revenue of $205.40 million. Shares of Diamond will attempt to rebound after falling more than 6.2% on Monday. CUDA: Barracuda Networks Inc. (Nasdaq: CUDA) will report fiscal second-quarter earnings after the bell. Estimize analysts anticipate the company will report an EPS of $0.10 on top of revenue of $78.78 million. Meanwhile, Wall Street analysts expect earnings of $0.09 per share on top of revenue of $78.67 million. CUDA shares were down nearly 3% yesterday. VA: Airline operator Virgin America Inc. (NYSE: VA) will report fiscal third-quarter earnings. Estimize analysts anticipate the company will report an EPS of $1.67 on top of revenue of $407.41 million. Meanwhile, Wall Street analysts expect earnings of $1.57 per share on top of revenue of $405.61 million. Shares of Virgin declined more than 4.7% on Monday after a broader sell-off in the airline sector. AAPL: Shares of Apple Inc. (Nasdaq: AAPL) will attempt to recover from yesterday's broad sell-off. The company announced that it has shattered expectations for sales of its iPhone 6 and 6s during its first weekend of sales. The company sold more than 13 million units during its debut weekend. Sales took place in more than a dozen nations, including China. RTN: Shares of Raytheon Co. (NYSE: RTN) are in focus after the company announced a five-year mega-deal with the U.S. Department of Homeland Security. According to the deal, which could be worth up to $1 billion, the company will help assist more than 100 civilian agencies in the management of their cyber security networks. TWTR: Shares of Twitter Inc. (NYSE: TWTR) are back in focus after a New York Times story suggested that many investors are rallying around interim CEO Jack Dorsey as the board's next choice for permanent CEO. The company has still not made a decision, but Dorsey co-founded the firm and has been credited for "massive changes" in recent months. 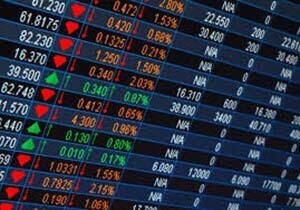 Additional companies reporting earnings on Tuesday include AZZ Inc. (NYSE: AZZ), IHS Inc. (NYSE: IHS), and Cantel Medical Group (NYSE: CMN).